As I wrote about previously, my friend B is getting married in March and she is (bravely) doing her wedding invitations here in Mumbai. This is a process that has some clear positives and negatives – the main positive is, not surprisingly, that it is much, much cheaper to do invitations here. The drawbacks are that the process takes longer and sometimes you fear that important elements will get lost in translation. But after a lot of searching B had settled on Nikunj – the only person on ‘wedding invitation street’ who spoke English well and seemed to understand what she wanted. He seemed to find us amusing enough to put up with the multiple meetings, emails, calls and tweaks that it took to get it right. I certainly enjoyed watching the process unfold – its amazing the difference between American and Indian wedding invitations. But eventually it came together: the design was set, the paper was picked and the colors agreed upon. It was time to print. Early on in the process Nikunj had offhandedly mentioned that they did the printing nearby and it was all by hand. We were instantly excited at the idea of seeing invitation-making in action. So Nikunj had agreed to allow us to go to the printers with him. We set off not really knowing what to expect. We walked up a steep ladder into a muggy room with 5 or 6 sweaty men – some were standing around, others diligently working on some letterhead. It was actually incredible – one by one they were making company letterhead with ink that they would briskly push across a silk-screen. B asked Nikunj if this was expensive letterhead – after all, getting each page done by hand must cost extra. “No, this is normal letterhead,” he replied, waving away the question as though there wasn’t any reason to think human labor was costly. And once again there was that reminder of the cost of doing business in India. To have two actual people sitting at a contraption manually putting out these pages was infinitely cheaper than buying and maintaining the machine that could do it without any help. But we soon got sidetracked once we caught sight of the silk-screen for B’s invitations. We watched as the printer carefully started gluing paper down – he was creating a corner to align each invitation so that everything would be straight. This was not a high tech process. Modern ink was being poured onto machines that clearly had been used for generations. 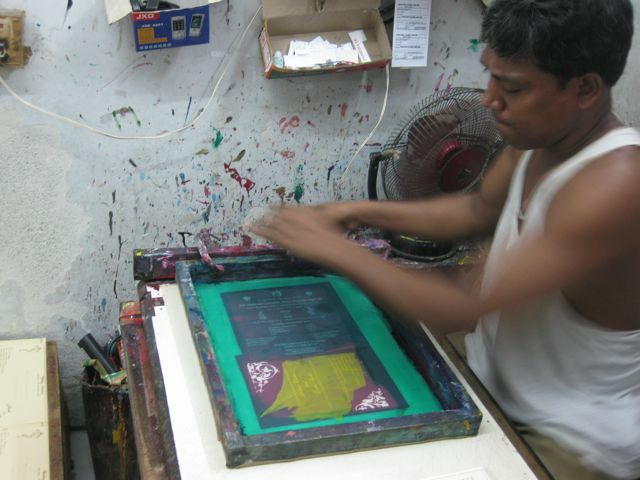 The silk-screens were carefully cleaned by hand after each test batch of color. Fans whirred away as we stood watching. I was glad we’d been allowed into this very specific world of printing. But I was also a little bit disappointed when, as we were walking out, Nikunj mentioned that in a few years he hoped to be able to buy machines to do the printing. His logic was that it would be faster. In the monsoon they wouldn’t have to wait for everything to dry. There would never be imperfections. I couldn’t help but think of the men who could mix ink with their eyes closed and our wonder at watching them whisk the ink over the paper like magic. Maybe that’s glorifying a sweaty workshop a little too much. But I started to feel like we were getting to watch an art that may not be around for too much longer. I think it might be time for me to order some new stationary.